Victor Fleming's 1939 musical adaptation of L. Frank Baum's children's book The Wonderful Wizard Of Oz (1900) for MGM remains as timeless as ever. I say it's Victor Fleming's, but Norman Taurog, Richard Thorpe, George Cukor and King Vidor all sat in the director's chair at one stage or another and Vidor's early Kansas scenes, including Judy Garland singing 'Over The Rainbow', remain in the finished film. The songs by Harold Arlen and E.Y. 'Yip' Harburg are funny and neatly interwoven into the narrative, the bright costumes and sets, referencing W.W. Denslow's original illustrations, are imaginative throughout and the performances are uniformly excellent. Ray Bolger, Jack Haley and Bert Lahr in particular excel as the Scarecrow, Tin Man and Cowardly Lion respectively, each bringing unique physical and vocal idiosnycracies to their oddball characters (sadly, a dance sequence choreographed by Busby Berkeley showcasing Bolger's buckling legs of straw had to be cut to save time). Re-watching Oz recently, I honestly think I enjoyed this even more than when I was a kid. Like many enduring films, there's a lot of back story to take in. Garland beat Shirley Temple and Deanna Durbin to the role of Dorothy Gale while former kindergarten teacher Margaret Hamilton, playing the cackling Wicked Witch of the West, was only brought in when original choice Gale Sondergaard (below) was considered too beautiful and baulked at the idea of being made-up as an "ugly hag". Frank Morgan as the "humbug" wizard was also not a first choice, his part originally intended for W.C. Fields until the Great Man's haggling proved too great a nuisance to frazzled producers. Morgan though more than made up for Fields' absence, gladly putting away enough sauce for two on set. Jack Haley wasn't pencilled in for the Tin Man either. He was only called up nine days into shooting when Broadway actor Buddy Ebsen (below) was hospitalised after inhaling some of the aluminium dust from his make-up, which coated his lungs and hindered his breathing. Haley, whose face was pasted instead of powdered, proved a terrific stand-in as the tearily sentimental woodsman but he too fell ill, suffering a bad eye infection from the greasepaint, further delaying matters. It's easy to see why The Wizard Of Oz has attracted so much speculation as to its underlying meaning over the years. In many ways, it's the ultimate American thirties movie, an escapist fantasy in the spirit of Harry McClintock's lovely Depression-era hobo ballad 'Big Rock Candy Mountain'. That decade was the American Nightmare after the dream of Fitzgerald's Jazz Age and Oz's Kansas sequences (i.e. the real world) are shot in dusty, sepia-tinted black-and-white, suggesting a drab, uncertain, dustblown existence for Dorothy out on the praire that could be disturbed at any moment by unforeseen disaster - the tornado as Stock Market Crash. Meanwhile, the candy-striped dreamworld of Munchkinland is under threat of invasion from tyrannical forces abroad (the Wicked Witch and her flying monkeys), echoing the distant, rumbling threat of Hitler's Nazis in Europe. Obviously such allegorical readings of Oz could only apply to the film and not Baum's novel, though that too has attracted much academic pontificating. In 1964, New York high school teacher Henry Littlefield put forward the theory that Oz was an allegory for American monetary policy at the end of the nineteenth century when the gold standard was being used to value the dollar and the country was emerging from 16 years of deflation, depression and debt. In Littlefield's interpretation, Dorothy represents the American Everyman, the Munchkins ordinary citizens, the Scarecrow the farming community and the Tin Man industrialised labour. The Cowardly Lion? William Jennings Bryan, the politician who backed the populist cause to get silver taken into account as well as gold. Dorothy's shoes in the book are silver and she must walk the Yellow Brick Road (the gold standard) to get to Emerald City (Washington, home of the greenback dollar) to confront the Wizard (the President), who, significantly, is not all he's cracked up to be. A fascinating theory, still taught in US economics classes, but undone by the film because producer Mervyn LeRoy thought ruby red slippers would make better use of Technicolor. 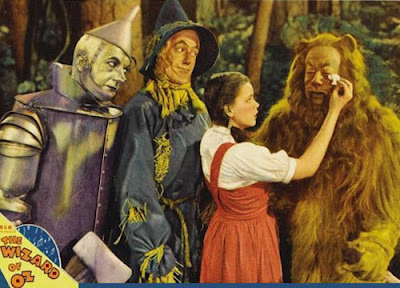 Whatever the underlying message, The Wizard Of Oz endures as an ode to friendship and self-realisation. However, as the years go by, the film continues to accumulate wearisome, unsavoury and downright prurient urban myths. While the Munchkins were indeed paid less than Terry the dog (well, Toto does appear in almost every scene), it's not true that the little people took revenge by staging wild drunken orgies at night. As for the famous dead Munchkin, said to have committed suicide by hanging himself from a prop tree and left in the final film, this is nothing more sinister than a rented emu wandering about in the background. It is true, however, that Margaret Hamilton was badly burned when a stunt in which she was required to disappear in a burst of flame backfired on set. Various celluloid attempts to revisit Baum's 14 Oz stories have been made over the years, most of which failed to come close to matching the joy and exuberance of this version. The Wiz, a bizarre Motown remake with Diana Ross and Michael Jackson reared its ugly head in 1978 and a disturbing but brilliant gothic sequel, Return To Oz, appeared in 1985, starring Fairuza Balk and featuring such darkly memorable Baum characters as Jack Pumpkinhead, Tik-Tok, the Wheelers and Mombi, an evil princess with 31 interchangeable heads. Rightly remembered as a cult classic, it bombed at the box office as a result of being too frightening for children and remains the last Oz film attempted as well as the only movie to bear celebrated cinematographer Walter Murch's name as director. A film about the Fed? What’s wrong with Economics?